Announced via Major Nelson's Twitter account just a couple days ago, the title that started the sun praising madness, Dark Souls, has been added to the list of backwards compatible games on the Xbox One. If you start now, you'll likely be able to play through the entirety of the game before the third installment arrives in just a little over two weeks. For those wondering how the transition of the tile has fared on the Xbox One, the kind folks over at Digital Foundry have put together a side-by-side comparison of the game running on both platforms. To answer the one question that is likely on some players' minds: yes, Blighttown is still a mess. My first experience with Dark Souls was not good. People told me "it's really good!" but I wasn't convinced. I don't know what it was that changed my mind. Maybe it was watching the way our intrepid video guy, Locke, and a former editor, Andrew, made their way through the title with such glee. Maybe it was realizing that death really isn't as punitive as I first thought it was. Or maybe it was just my tastes in gaming changing as I grew older. 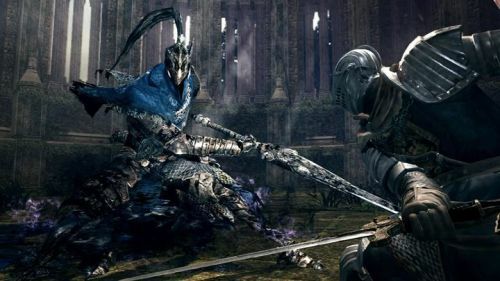 Whatever the case, the Souls series and its offshoots have now become some of my favorite co-op experiences in gaming today. Page created in 0.2741 seconds.